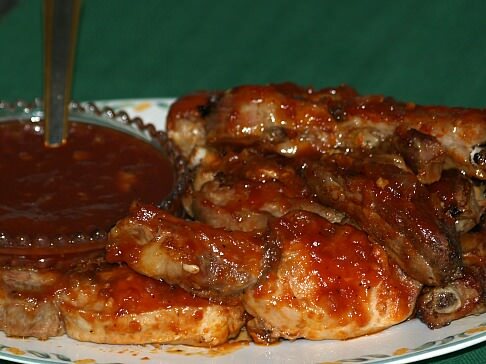 When I learned how to make barbeque pork ribs recipe, I found it is a favorite in many parts of the world. I never realized this, or maybe I just never thought about it before but as I have traveled bbq recipes have come to be very apparent. As you probably know, pork comes from young pigs and is so versatile. When I was young, my family raised pigs. We were not allowed to make them our pets because they were for butchering. We saved all our vegetable scraps from our large garden and leftovers if there were any to feed to the pigs. You know that pigs are actually gourmet eaters showing preference to vegetables and fruits. In the fall when we butchered, we had the best meat. The men would smoke much of it in preparation for winter, salt some of it to preserve and freeze the rest. Many of my friends and acquaintances in Ecuador include a lot of pork in their Ecuador cuisine. The flavor of the pork in Ecuador is excellent. I got the biggest thrill in watching how the locals feed the pigs down there. Every morning you can see them bring the animals out to the roadsides where there is plenty of grass. They tether them on a rope along the roads so they can eat all they want. In the evening you will see them all come again to gather up their animals. This is really a sight to see and I believe this is what makes their meat taste so good. Many of the homes have outdoor fireplaces where they learn how to make barbeque pork ribs recipes. These are delicious. 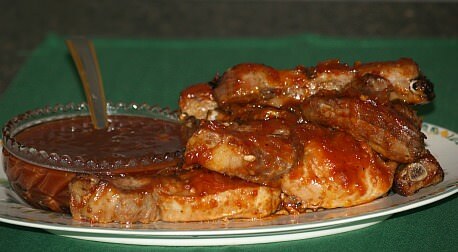 My Dad and brothers knew how to make the best barbeque pork ribs recipe which became one of my favorites. Ribs do not take long to cook due to all the bones running through the meat. This was a favorite of our family to barbeque on our big fireplace in our backyard. Good pork is suppose to have smooth lean meat with a color of pale pink and a firm white fat. Bones of pigs should be pinkish blue and the rind is thin and subtle. Pork should always be cooked thoroughly before eating. Almost everyone, especially if they are a “cookout chef” has their own barbeque pork ribs recipe. If you are just learning how to barbeque ribs you must realize that there are several types of pork ribs alone depending from what part of the pig they are cut. Also the thickness in which they are cut and the fat on the ribs add to the differences in the flavors of your barbeque pork ribs recipe. Although I love all the barbeque pork ribs recipes when properly cooked and seasoned, I must say my favorites are the barbeque baby back ribs. These are cut from the top of the rib cage. These ribs are shorter, curved due to the natural taper of the pig’s rib cage and sometimes meatier than spareribs. Meat from all animals seen to be more tender and flavorful right next to the bones; having about 10 bones to a rack of ribs makes these so delicious. Other spareribs or the wider ribs are taken from the belly side of the pig. These flatter ribs contain more bone, less meat and more fat which does make them more tender. Like I said, all ribs are great if cooked properly! I am also fond of what are called “country style ribs”. These are cut from the blade end of the loin and have more meat than other ribs. Some butchers make other cuts for customers like the riblets (these make great barbeque appetizer recipes) which you may see in the restaurants sometimes. Cook onion slowly in olive oil until tender; add tomato paste and vinegar and blend in until smooth. Blend in the chicken stock; then honey, mustard, garlic and herbs. Cover and simmer for 15 minutes; if it thickens too much add a little more stock. Stir in Tabasco and let set until cool. Cook ribs until almost done; brush with sauce and cook a few minutes on each side. If you want to serve any remaining sauce with ribs, bring to a boil again. Rub salt all over pork loin ribs; grill ribs over covered grill until done turning occasionally. Cook onion in water for 3 to 4 minutes in medium saucepan. Add remaining ingredients and cook slowly for 15 minutes. Brush ribs with sauce during the last 10 minutes of the cooking. Serve remaining sauce with ribs. Cook ribs on grill until almost done. Combine remaining ingredients and blend; brush ribs with glaze and cook until thoroughly done and tender. To serve remaining sauce with ribs, bring mixture to a boil. This barbeque pork ribs recipe is always flavorful. Cook ribs on grill until done and tender; place ribs in shallow pan for grill. Combine remaining ingredients in saucepan and stir to blend; Heat sauce until very hot. Pour sauce over ribs making sure all are covered; close grill lid and cook with indirect heat for 15 minutes. Cut ribs into serving pieces; place in pot and cover with water. Bring ribs to a boil, cover with lid, reduce heat and simmer for 30 minutes; drain. Combine onion with next nine ingredients in a saucepan, cook over medium heat for 5 minutes. Reserve 1 ½ Cups of sauce. Cook ribs over medium hot coals about 15 minutes and baste with remaining sauce. Cook another 25 to 40 minutes turning and basting until ribs are thoroughly cooked. Serve reserved 1 ½ cups sauce with ribs.